Posted at: 10/10/2010 03:06:00 PM . Volume Vote once again has a great song available for free. 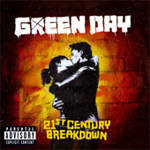 Today's song is 21 Guns by Green Day. Remember that Volume Vote offers a different song each day so this song won't be available after today.